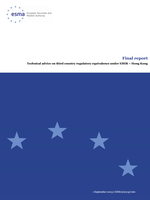 MEMOFIN - Rapport Annuel 2012 de l'Autorité européenne des Marchés Financiers - L'information financière que vous ne trouvez nulle part ailleurs ! ESMA has successfully completed its second year of operations as the European Union’s (EU) independent securities and markets regulator. This second Annual Report documents how ESMA has established itself as an institution and the progress it has made in meeting the objectives set for it by the European Parliament and Council. promoting and furthering investor protection; and contributing to the financial stability of the EU.